Eco World Development Group Bhd will take up the offer to buy 190.2ha in Batu Kawan from Penang Development Corp (PDC) for RM1.02bil. PDC is offering the sale of the property to Eco World as the group is the only bidder. 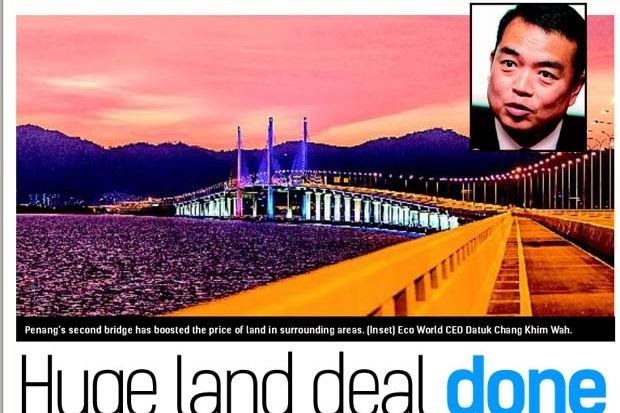 It is learnt that PDC will give Eco World the offer letter in two weeks to buy the property at RM50 per sq ft.
PDC has firmed up plans to turn the 190.2ha near the second Penang bridge into a golf course and a mixed development project. Of the 190.2ha, Eco World will develop a golf course on 60.7ha and use the remainder for a mixed development project. The group plans to build landed properties on the hilly portion of the land and a waterfront city, overlooking Penang island. The development density for Batu Kawan is between 11 units and 60 units per acre, depending on the approval given for the development. Eco World already owns 24.28ha in Bukit Tambun, on which it plans to launch a RM920mil mixed development called Eco Meadows next year. With the acquisition of this 190.2ha, Eco World is set to be a major landowner and developer in Penang. Since the announcement of the second bridge in 2006, property prices in Seberang Prai and on the island have surged significantly. The price of vacant land in the area, especially in south Seberang Prai where the second bridge is located, is now hovering between RM40 and RM50 per sq ft, a huge jump from 2006’s RM8-RM9 per sq ft range, according to Henry Butcher Malaysia (Seberang Prai) Sdn Bhd associate director Fook Tone Huat. Land prices in central and north Seberang Prai are now within the range of RM50-RM100 per sq ft, compared with RM20-RM40 per sq ft then. In 2007, Asas Dunia Bhd bought 138 acres from TPPT Sdn Bhd for RM5.58 per sq ft. In 2014, Tambun Indah Land Bhd purchased 200 acres agriculture land in Simpang Ampat for RM16.40 per sq ft. Recently, PDC sold 99 ha in Batu Kawan to Aspen Group Holdings for RM45 per sq ft to develop the Aspen Vision City. It will have residential properties, offices, medical facilities, a large central park, international school, retail shops and an integrated central integrated hub for Seberang Prai. If converted for mixed development, the property can be valued between RM20 and RM30 per sq ft at today’s market price. On an adjoining land measuring 121.4ha, sources said, a large Kuala Lumpur-based resort and theme park operator had made a bid with an overseas developer that specialised in theme park development. In May this year, Eco World president and chief executive officer Datuk Chang Khim Wah told StarBiz that the freehold land status and location near the second link and adjacent to the North-South Highway gave it great potential to be developed as a mixed development project. He said the company was planning the development of a mini mall, comprising shops and offices in line with its “Eco” theme that emphasises sustainability and livability. “Over time, we aim to build up our presence in Penang to consistently contribute between 10% and 15% to total group sales,” he said.